I received my first journal as a present when I was 9 years old. I began writing and never really stopped (I'm currently on my 25th). While I don't expect my journals to ever be published as some epic memoir - let alone read by anyone but myself (the horror!) - they have become a very interesting way for me to look back at the different phases and major events of my life. Over the years I have collected lots of journals. Some of them very beautiful, and others cheap and tacky. It's the cheap and tacky dollar-store journals that I have recently become very interested in. Because the bindings themselves are usually quite solid, they are perfect for re-covering. And the possibilities are endless. Here are a few that I recently re-covered with photos taken from art gallery pamphlets. And here are a few that I bound myself. 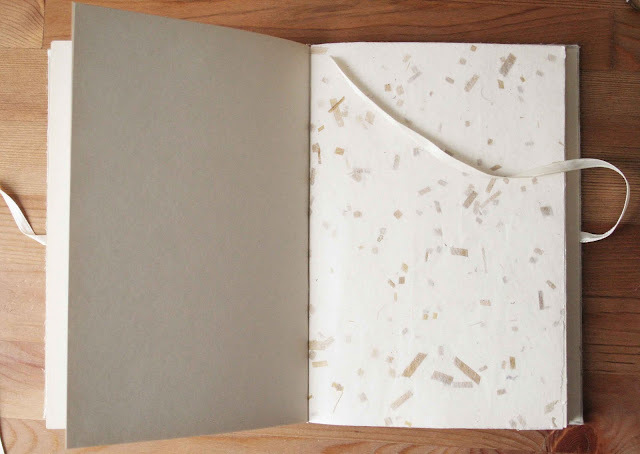 The cool thing about hand-bound journals is that you can customize the shape, size and paper. For these journals I used two different binding techniques. The pages in the beige and orange books were sewn together with a needle and thread (the way most hardcover books are bound today) and glued to the cover. The blue book was bound by drilling holes through the paper and weaving in a blue ribbon to hold the pages and cover together.